What are you doing New Year's? 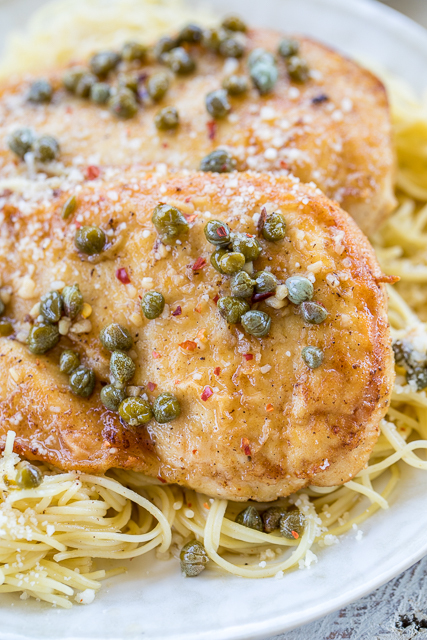 We are staying in and making this Champagne Chicken Piccata. 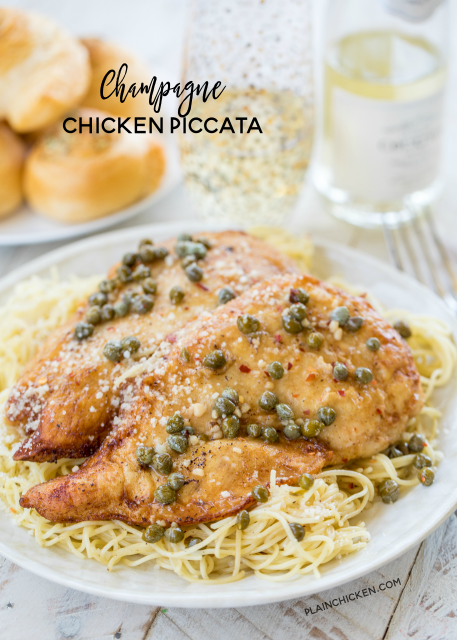 We love chicken piccata and this Champagne Chicken Piccata is THE BEST!!! It tastes better than any restaurant and is surprisingly simple to make. It seriously only takes about 10 minutes and you are ready to eat! 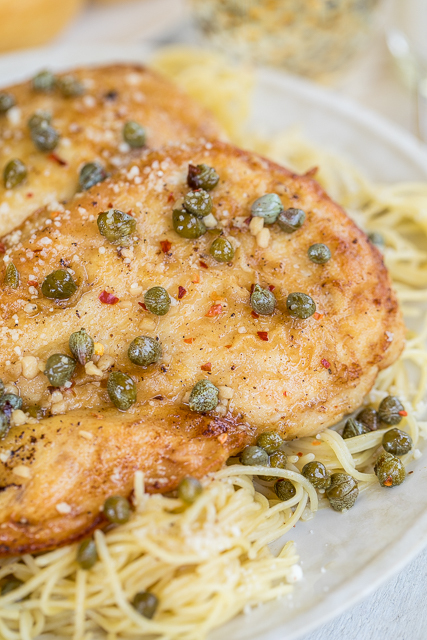 This Champagne Chicken Piccata is fancy enough to serve at a dinner party. All you need is some pasta and some garlic rolls and you are set! Oh, and maybe some more champagne. You always need more champagne! Just don't forget to spoon all that yummy lemon champagne sauce over the chicken and pasta. It makes all the difference!!! SO good!! Mix together the flour, salt, pepper, and grated Parmesan. Rinse the chicken pieces in water. Dredge them thoroughly in the flour mixture. Heat olive oil and 2 tablespoons of the butter in a large skillet on medium high heat. Add half of the chicken pieces to the skillet. Brown well on each side, about 3 minutes per side. Remove the chicken from the pan and reserve on a plate. Repeat with remaining chicken. Cover plate with aluminum foil and keep warm in the oven while you prepare the sauce. Add the champagne, garlic, lemon juice, and capers to the pan. Reduce the sauce by half. Whisk in the remaining 2 tablespoons of butter. Plate the chicken and serve with the sauce poured over the chicken. Serve over cooked pasta if desired. What can you substitute for the champagne? Would Prosecco be a good substitute for champagne? What champagne would you recommend for this? I typically like a sweeter champagne, but not sure if that would work in this. I definitely recommend using a champagne that you like to drink. I just bought a single serving size bottle at World Market for this recipe. 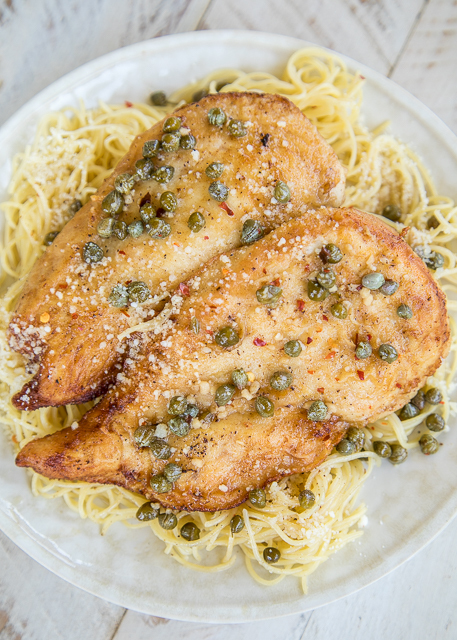 Looks delicious Steph - hard to go wrong with lemon, butter, caper sauce. We'll give this one a try.